Dan Austin assesses the impact of Fabinho following the Brazilian's breakthrough into the starting eleven. Liverpool’s capture of AS Monaco captain and Brazil international Fabinho back in May went a fair way to lessening the hurt of the European Cup final defeat to Real Madrid. After a season of remarkable results and rip-roaring football culminated in such an insipid fashion in Kyiv, the signing of one of the continent’s most sought-after midfielders was evident proof that the club was ensuring that it capitalised on its forward momentum and raised standing in world football, rather than licking its wounds. A vociferous section of the Liverpool support had been clamouring for the arrival of a traditional defensive midfielder for many a season. They decried the performances of Jordan Henderson in deeper positions. They wanted more protection for a defence they thought wasn’t strong enough on its own. They yearned for a shield. Finally, the player they dreamed of was here. Except his performances against Red Star Belgrade and Cardiff City have proven that Fabinho is much more than a simple screen in front of the back of four. Anybody who saw him play for AS Monaco during his three years in the principality could easily have told you as much. After making the transition from right-back to central midfield, he became not only a resilient and intimidating figure in the middle of the park, but also served as the focal point for counter-attacks, consistently passed the ball vertically to link the midfield to the front-line, and dictated the speed at which Leonardo Jardim’s side played. In the summer of 2017 the Monegasques allowed Benjamin Mendy, Bernardo Silva, Kylian Mbappé and Tiemoué Bakayoko all to move on for the right price, and were willing to sanction Thomas Lemar’s departure had an offer deemed sufficient come from either Liverpool or Arsenal. But both owner Dmitry Rybolovlev and manager Leonardo Jardim refused to entertain the idea of selling Fabinho. This summer they could not force the Brazilian to stay. His importance to the team is highlighted by the fact that, just a few months after losing their captain, Jardim is out of a job and Monaco are drowning in Ligue 1’s relegation zone. The start to his Liverpool career has been much more understated than either he or Jurgen Klopp would most likely have expected. The competition for places in the centre of the Reds’ midfield will have been a major factor in his limited minutes so far this campaign, and issues such as the language barrier and settling into a new society can never be underestimated. 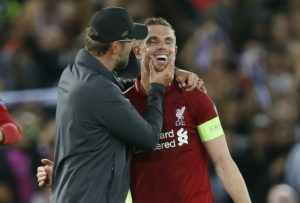 But in those two first consecutive starts, with Henderson (below), Naby Keita, and James Milner all struggling through injury, Fabinho has asserted himself upon the midfield in a way which demonstrates both his physical authority and his ability to affect the match in the opponents’ half. Against both the Serbian and Welsh outfits, Fabinho demonstrated the efficacy of his telescopic legs not only in recovering the ball, but in striding forward into opposition territory on multiple occasions in order to turn defence into attack in an instant. Both sets of opponents were clearly some of the poorest it is possible to come up against in either competition, but for the former Real Madrid player to slot seamlessly into a side which had been so settled, while also putting his own stamp on the way in which the midfield operated, is testament to both his self-assuredness and adaptability. Liverpool supporters have now borne witness to the first hints of the impact he could have at Anfield in the long-term. Whether he maintains his place in the side for the trip to Arsenal is not entirely clear. With Gini Wijnaldum playing the best football of his career and almost certainly assured of a place in the starting eleven, Xherdan Shaqiri beginning to adapt successfully to a deeper lying role, and Milner and Henderson approaching full fitness, Klopp may well decide to go with different options against Unai Emery’s resurgent Gunners. Having those options to choose from, though, will be vital over the full course of an incredibly intense campaign in which the Reds are looking to seriously challenge for the highest honours in both domestic and European football. At times there will be rotation, and there will be horses selected for particular courses, but all of Liverpool’s midfielders will have a significant part to play throughout the entirety of the season. With Fabinho now settled into his role in the side, his influence will only grow from here. * odds are subject to change. RedsBet is the only bookmaker committed to sharing 50% of net profits directly with Liverpool fans.